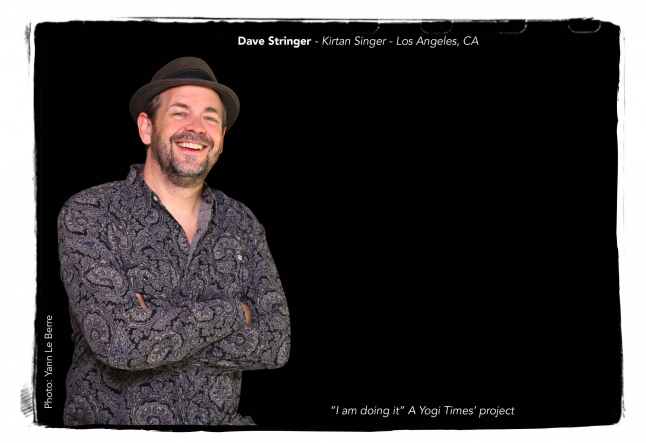 Dave Stringer is the equivalent of a yoga rock star supporting famous yoga teachers with Kirtan, worldwide. His chanting, rooted in Bhakti yoga, transcends genres from lullabies to rock. He makes chanting ‘cool’ while opening up a spiritual conversation for those put under his blissful spell. Fresh from the Bali Spirit Festival, we met with Dave poolside to learn more about his captivating Kirtan performances. As a leader in his community, we’re glad to invite Dave to join Yogi Times’ I AM “DOING IT” project. YT: You have been invited to join the “I AM DOING IT” project, Yogi Times’ global outreach to the communities worldwide to be “doing it” - raising consciousness within their community…how are YOU doing it in your own community? On a worldwide, cross cultural level, I am inviting people who don't necessarily share a language with me to sing together in a very old language, rich with philosophical meaning and symbolism but also deeply embedded in a particular sonic ability to make us feel better. I travel, leading chants and connecting people to each other and to themselves through music. The process of traveling and leading chants is the yoga, the outcome is intimately connected to it, and it is always full of wonder of joy. It is a model of how we overcome our obstructions and differences in the service of something better and brighter. YT: And can you tell us why you are “doing it” the first place? I do what I do because I am skeptical and interested and a little bit crazy and full of wonder about what consciousness is and how it connects us together. Music has this incredible ability to connect people and transform the way they feel. I can start out a chant in a terrible mood, and always end up feeling better while shifting the awareness of other people at the same time. I travel and lead Kirtan because I am curious. I am interested in the nature of consciousness, how it arises and how it connects us together. The mystery is, no one knows what it is or how we get it. We do know that it is essential to the way that we connect and enjoy our lives. Chanting is a beautiful model of consciousness. We may not understand each other but we can sing together. When we sing together, we become united in a conscious state that moves and shifts together. I can’t control it, I only put it in motion and the results are always ecstatic. I always feel better and more connected in the end. YT: What brought you to your job as a Kirtan singer? Dave Stringer: It was a series of unintended consequences. I was a conventional musician and songwriter with a dream to make it in Hollywood when the opportunity to work in India as a film editor came up. Without sounding too kooky spooky, I actually appeared in a friend’s meditation as the best person for the job and being jobless and broke, I had no choice but to accept. My employer was Guru Mae in India and my workplace was an ashram and it was there my love affair with yoga and chanting began. My first introduction to chanting had been in the 1980’s when I was dragged into a Blues Barat 3am by a friend where we ended up chanting mantras somewhat under the influence! Realizing how ‘clean and clear’ I felt, my interest was piqued. As my chanting journey unfolded, I started to see chanting as a nonsensical way to shut down the mind and a natural way to experience ecstasy! Having always been interested in science and the process of inquiry, my time in India gave me a chance to explore chanting from the perspective of neuroscience and psychology. I learned and perfected the art of chanting through school kids in India. I would practice this technique of call and response with them daily. I was working on this ashram, loved yoga, chanting and being a musician, and so began DaveStringer.com. No one was DOING that back then. I credit yoga teachers Seane Corn, Saul David Raye and Shiva Rae for bringing together the package of physical practice with chanting. They have been instrumental in my journey and successes. I feel like I didn’t DO anything. It just happened. YT: If there were one thing you want every student to learn from your chanting, what would that be? Dave Stringer: I believe there is an artist in everyone. We are musical instruments and our purpose is bound up by our sense of self and ability to shift our awareness and consciousness. The practice of Kirtan brings about an awakening of desire to directly participate in culture rather than consuming it. The whole experience of chanting together gives people a glimpse of their artistic, ecstatic essence bubbling away within. YT: What part of the work brings you the most joy? Dave Stringer: When singing, I am purely present and focused in this moment right now. The problem is that nowadays only 10% of my time is devoted to singing, the rest is logistics! Sitting with my guitar and harmonium and writing songs brings me personally the most joy. YT: Can you tell us more about the benefits of chanting? Dave Stringer: On the level of enjoyment, it is obvious that chanting elevates mood and awareness, bringing people together. On a more scientific level, and I love this part, Kirtan manipulates one’s neuropharmacology. There is a structure that we follow whereby we start with an easy listening, centering tune, which is fast, simple and happy. We then move on to longer cycles which demand deeper breath work and after 2 hours of intense pranayama, the level of the brainwaves are all lined up and breathing is in synch. The sympathetic and parasympathetic nervous systems are simultaneously balanced leading to a release of a neuropeptides very similar to “E”. The parietal lobe of the brain (where the crown chakra sits) contains the left and right hemisphere representing “I AM” and “HERE” respectively. So through this repetition of breathing and reduction of the neural flow, boundaries are eliminated and you arrive. ‘I AM HERE’. We all become ONE yet we are still very much ourselves. Pure bliss! YT: When performing, is there any aim in mind? Dave Stringer: Yes absolutely. I know when I have done a good job when upon finishing, there is a state of profound silence brought on naturally as opposed to being drug-induced. The participants are connected in silence. YT: Is there any special diet that enhances your performance? Dave Stringer: Nowadays I spend a huge amount of time on the road and unfortunately I am unable to control my intake the way I would back home. I tend to gain weight on the road and lose weight at home. When away, my routine is all over the place and I often find my meal times following a pattern of 12pm, 5pm and 12am. I used to be vegetarian but with irregular patterns like these, you just need to take what you can get. I do find I crave protein more when performing. Pre-performance, just like a yoga class, I tend to abstain from meals for 2-3 hours. YT: What has been your favorite setting for a performance? Dave Stringer: It’s hard to say as we have taken Kirtan to many exotic locations but the recent performance inside the Balinese temple in Legian was mind-blowingly atmospheric. It was the first time we had practiced in a temple. Since Balinese Hinduism and Indian Hinduism differ slightly, we weren’t sure how it would integrate. From all accounts, it seemed to be a success and on consultation with Ron Weber, the director of the Bali Spirit festival, we are keen to incorporate more of the Balinese musical instruments like the gamelan when we return to Bali. We don’t want to be cultural invaders nor purist in our approach but strive to find a model harmonizing the two. YT: Finally, do you have a favorite quote to leave us with? ‘At some point in life, you need to take a risk’. If I had never accepted that job offer in India, who knows where I would be now.